The ScanLife Consumer Behavior and Preferences Infographic has arrived! We surveyed more than 15K of ScanLife mobile app users to learn more about their mobile behavior and individual preferences. Our findings reveal interesting buying behavior, from coupons and shopping activity to app interests and more. As shown in our latest infographic, the ScanLife mobile app users enjoy shopping and saving while doing so. 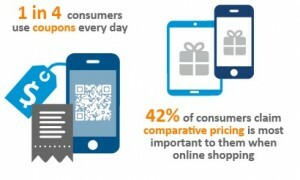 One in four survey respondents said they use discount coupons every day while another 38% said they use coupons weekly. Receiving product discounts and coupons was the information they wanted most (75%), while receiving new product information was the second most popular reason. Click here to download a copy of the ScanLife Consumer Behavior and Preferences Infographic. Thank you to all of the consumers who participated in our bi-annual survey!